What is it? 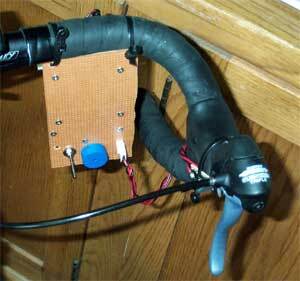 My bike horn is a prototype that contains a digital sound chip and a Mallory Sonalert® siren. One tactile switch plays a recorded sound, while another activates the siren. The ability to record and playback a sound gives the bike horn a unique sound. Why I built my own? I like building unique gadgets. I ride a multi-user trail, and at times walkers don't hear or respond to "on your left". There are also a few narrow blind tunnels and hills where it's nice to warn an oncoming rider of your approach. A friend uses a mechanical bell that sounds like an ice cream truck. I wanted a unique sound. What's the prototype like? It has a commercial sound recorder chip board that will both record and play sounds. The MX022 is a 3.5" by 2.5" board with a sound chip, 720 mw audio amp, and a microphone. The recording source can be the onboard microphone or a line input. The MX022 is overkill for this project. 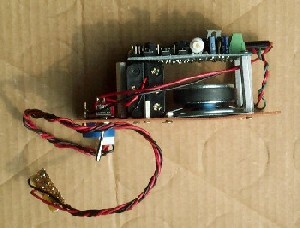 I plan to replace the sound card with a simple playback board that will contain only the record chip and an audio amp. I recorded a sample of Fishbelly Black's "Spontaneous Combustion" from their self-titled CD. This jazz number includes a Brazilian cuica that, to me, makes a "wok-WHOK-a" sound. Here's the sample I recorded into the sound chip: Spontaneous Combustion Sample. The other alarm is a Mallory Sonalert MSR516XR. It has a siren sound and is rated at 82 to 91 db. I added this alarm before I knew that the sound chip board would produce adequate volume. 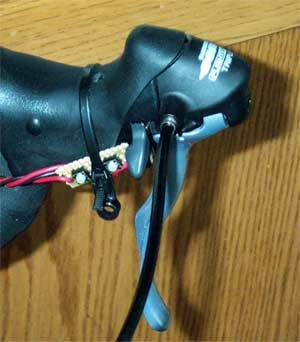 The two sounds are activated using two tactile switches mounted near the left gear shift leaver. The remaining parts are a 6 AAA battery holder, an on/off switch, a speaker, and a quick disconnect connector for the wires going to the tactile switches. How well does it perform? It works better than I thought it would in that the sound board/speaker combination produce an adequate volume level. I can wok-whoka someone about 30 feet away, and they will typically hear the distinctive sound. The amp does distort some; however, it's not too objectionable for a bike alarm. The Sonalert is loud and too high pitched, perhaps, but the sound has a noticeable attack delay. So small bursts can be given at close range. I don't know how dogs will like it. I definitely need to convert the prototype into a smaller unit. Because of the bumps on the trail, it's also a good idea to tape the batteries in the battery holder. A 9-volt battery might work, but I'm not sure how long it would last. The components: There is a 3 1/8" X 5 3/8" board that contains all of the main components and a small board with the two tactile switches. 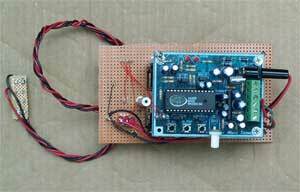 The main board contains the commercial sound card, Sonalert, batteries, speaker, and the on/off switch. 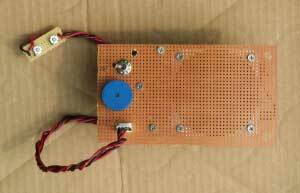 The sound board is mounted over the speaker and batteries using standoffs. How does it attach to the bike? I mounted the tactile switches on a small board. The switch board connects to the main board using a 3-wire cable that can be disconnected at the main board. Both the switch board and main board are attached to the bike using cable ties. 2 Tactile switches: Omni 6x6 flat 5mm, Mouser number 653-B3F-1022. Molex pins, housing, and header (Mouser numbers 538-08-50-0114, 538-22-01-2047, and 538-22-23-2041) for jack and plug for connecting to the switch board. 6xAAA battery holder, Mouser 12BH463-GR. Contact: hamk2 at tuxcat com.